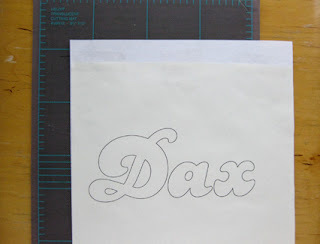 Step 2: Print out the name you'll be using for the design directly onto a piece of freezer paper trimmed to 8.5" x 11." Step 3: Carefully cut out each letterform using a craft knife, saving the inside pieces of your letters (like the inside areas of my 'D' and 'a'). Take care to have clean cuts, resisting any urge to tear away any pieces that may be attached. Because a stencil with crisp lines = a crisp paint job on the shirt. Step 4: Lay out the letters you just cut out onto your shirt. This is for placement purposes. So you know exactly where to lay down your stencil (second pic below). And I highly, highly recommend American Apparel tees. Here is a link to the ones I used, and link to baby onesies and lap tees. Step 5: Remove the letter cutouts so that all you are left with is the stencil. Lightly run over the stencil with a hot iron. 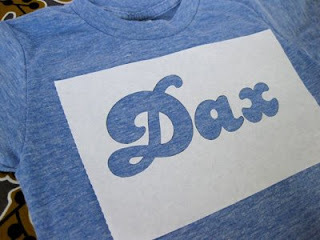 Add in those tiny inside pieces of your letters and iron again, making sure the inside edges of the stencil completely adhere to the shirt. Now this is where my tutorial differs from the ones I've seen online. I'm only able to get my hands on the "cheap" fabric paint locally. And since I'm too impatient to order the good stuff, I settle on these for instant gratification. 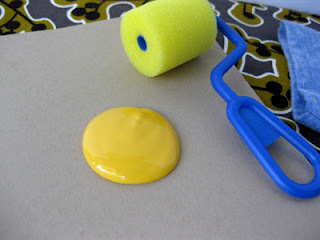 Roll or brush on the ink, painting away from the edges of the stencil. You don't want to push any ink under the edges of your stencil, otherwise you won't have sharp edges. I find that I have to use a considerable amount of paint to get it really solid. 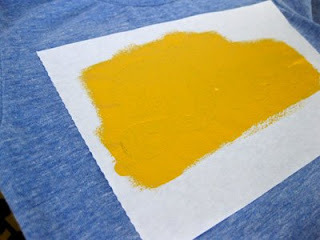 Just add the paint gradually and make sure a piece of paper or cardstock is under that t-shirt to prevent any paint from soaking through. If you have the patience, you may want to do a couple practice runs on a test fabric before you paint on your pretty shirt. Of course, this means cutting out more stencils because each stencil is a one-time-deal. 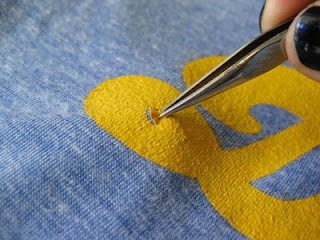 Step 7: When dry, slowly and carefully, peel off the stencil. Using tweezers, pull off the smaller stencil pieces. I've also done this part successfully while the paint was still wet. I actually got a cleaner line because this type of fabric paint tends to dry thickly, almost like a thin layer plastic. Just be careful not to smear the paint if you go the wet route. Step 9: Set the paint by lightly ironing the backside. 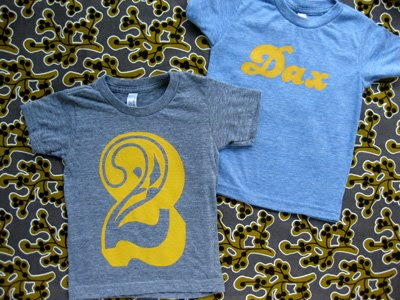 My head was in the shirt stenciling game when I put together this tutorial, so I went ahead and made an age one for Dax. The font I used here is Rosewood (you'll have to purchase this one). Quite a bit of cutting involved, but I think it turned out pretty awesome. 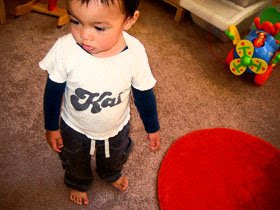 Even big brother Kai really liked "the shirt with the number on it." 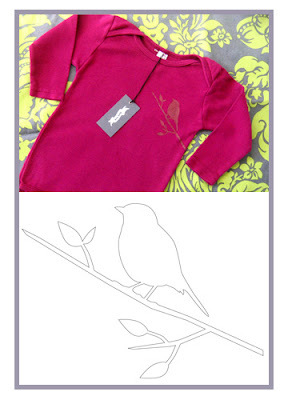 And lastly, I wanted to add a download of one of my very first t-shirt stencils, bird on a branch. Hope you can find some fun applications for this! I plan to add another stencil download at my blog Ambrosia Girl next week, so make sure to stop by. Great post Jenn! You make it look so easy and fun. The number tee is pretty cool. Love those! I've been looking for cute boy things to make since I've been in the girl scene with my first. Question- where do you get those cute heathered shirts? This is my favorite post in a long time. Thanks for the idea. Thanks for the great ideas! I love how simple and modern your shirts turned out. I may be doing something wrong, but it looks like the candice font in now only a commercial font. Oh well. I found one font, creampuff, that might be a good free substitute. I'm definitely trying this! thanks! Kinzie Sue: I used American Apparel shirts. I added a link in the post. This font download should work! Jenn great post. I always drool over your work, but now I can make my own clumsy knockoff; I'm so excited! ooo! I love the #2 shirt! LOVE, LOVE, LOVE these shirts! Thanks so much for the tutorial!!! Great tutorial. I love these shirts! Thank you so much for the tutorial! I'm definately going to try this! These are amazing! I may have to get hat Rosewood font, it's wonderful! I'll be linking to this post if you don't mind. I think maybe even I could pull this off. very cool. these look so cute! Great job! But I need to ask - what is "Freezer paper"? Does it have another name? Great post!!!!!! First of all, I love the font Candice and use it frequently. Secondly, fun! Romana - freezer paper is butcher paper that is coated with plastic on one side to keep moisture in. I found mine at the grocery store near the foil/saran wrap. i love this! i'm gonna make these for my little cousins b-day :) thx for the great instructions! I simply love doing freezerpaper stencils, which is very uncommon in Germany. It´s so easy! This was a fun project to do. Thanks for the tutorial! ever met anyone else that had a son named Dax!!! Thanks for the tutorial. Great idea! I tried it and it works! Beware!! I printed the stencil onto a piece of freezer paper and it melted into my printer!! Off to buy a new printer tomorrow. 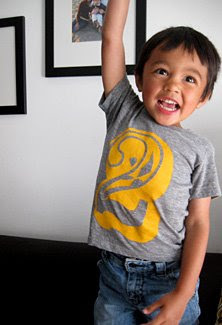 Ok, after getting a new printer I made an awesome t-shirt for my three year old son's birthday. It turned out great!! Thank you for the idea! These t-shirts are the cutest! I've featured it in a DIY roundup on my site today as well. Thanks for the great ideas!! But the others are super cute!